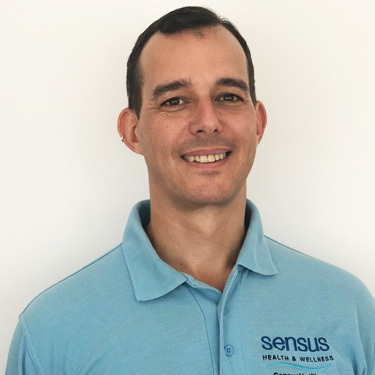 Dr Kris Harm leads chiropractic care at Sensus Health & Wellness. With over 20 years of experience, he has impacted the lives of countless people through his profound knowledge and understanding of chiropractic. At a young age, Dr Kris knew he wanted to help change the world through chiropractic. Initially interested in teaching, his focus shifted to physiology after meeting a successful physiologist and taking a liking to his story. Displaying an interest in human anatomy for as long as he can remember, Dr Kris realised after several gymnastics-induced injuries that his real passion was in how the body heals. Chiropractic was his calling. One of my coaches was a chiropractic student. I went to his clinic with my injury, and he managed to sort me out much quicker than anybody else. At the time Dr Kris was pursuing his training, after reviewing options for chiropractic schools located in the United States and the United Kingdom he chose a chiropractic school in Stockholm, Sweden. Dr Kris thoroughly enjoyed his time as a student and completed his education at Scandinavian Chiropractic College in 1997. Since then, he proudly began his practice and continues to learn about chiropractic and grow his craft. He holds GCC (General Chiropractic Council) number 01840. When he is not busy with clients, Dr Kris finds great joy in studying nutrition, traveling, and maintaining physical fitness. Through his travels he has been to several other other countries, including the United States, Australia, and China. Dr Kris’s love of learning causes him to enjoy exploring new cultures. He is Sweden-born and living in London. Not only does he speak three languages, Swedish, German, and English, but he is also a member of the Royal Chiropractic College and the Royal Society of Medicine. In addition to these acknowledgements, he was a successful competitive gymnast until he was 17 years old and was also enrolled in the Army of Sweden as a paramedic. Dr Kris’s experience helps him assist his clients with neuro-musculo-skeletal problems ranging from whiplash and neck injuries to TMJ and back problems, such as lumbago and sciatica, and postural issues. Whether you have an injury related to sports or your workplace, Dr Kris is here to help you clear the subluxations. Learn more about his expertise when you visit us for your first appointment.